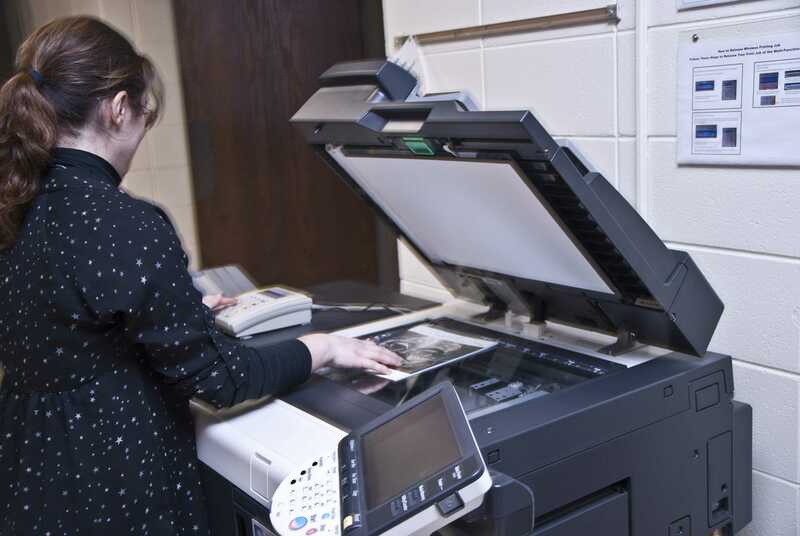 Student using an NEIU copier with scanner function. If patent trolls prevail, NEIU (and through the resulting new tuition fees students) would theoretically be required to pay a usage license fee for the right to use the machine. Trolling, the act of intentionally inciting anger or distress, usually through posting a message, derived from the fishing action of dragging a lure until something (or someone in this case) took the bait. It is a term that anybody who has used the internet for the past five years should be familiar with. Aside from irritating or shocking their intended targets, trolls are generally harmless. However, the similarly-named patent trolls aren’t as harmless as their Internet counterparts. Patent trolls are individuals or companies that buy up patents from bankrupt companies or renew old patents that have lapsed. With these patents, they then sue rival companies claiming that they had the idea first. Unlike most companies patent trolls, also known as NPEs (Non-practicing entities) have no intention of marketing or manufacturing their patented invention. Instead they make their money by suing active companies with the intent of settling out of court. Recently patent trolls have begun attempting to enforce patent licensing fees on end users and consumers, a move which, if successful, may become their main source of revenue. Patent trolls will stop at nothing to “protect” their ideas, even if it means they have to go after the average consumer and small companies. In a recent case, a patent organization known as Project Paperless LLC, began sending letters to small businesses such as BlueWave Computing. These letters stated they needed to pay $1,000 per employee to license a technology patent Project Paperless described as used for “distributed computer architecture.” Basically, BlueWave was told they need to pay $1,000 every time a document was scanned and emailed. Though why would Project Paperless go after BlueWave and not Canon, Brother, Xerox or Hewlett Packard (HP), the entities making the scanning technology that they claim was infringing on their patent? A recent journal article by Prof. Colleen V. Chien of Santa Clara University found that 55 percent of defendants to patent troll suits are small businesses, and gross less than $10 million in annual revenue. This finding makes sense, as larger companies often have better-funded and more aggressive legal departments. Going after individuals and small companies by way of letters demanding payments for alleged infringement by threatening legal action has been a successful legal tactic used by the Motion Picture Association of America (MPAA) and the Recording Industry of America (RIAA) in recent years. When faced with the prospect of high litigation court costs associated with suing a large entity such as Canon or HP, Project Paperless LLC likely chose the relatively low-cost option of sending out letters to collect royalties from small business consumers. BlueWave refused to pay the demanded licensing fee for using technology it legitimately purchased on the consumer market. When sued by Project Paperless, BlueWave “actively pursued counter-claims” and Project Paperless “ultimately dismissed the case without conditions or any opportunity for further recourse,” according to a statement released to the press on Aug. 6, 2012. Due to constant advancements in technology, patents are put in place to protect designs, software, or components for future hardware. Actually having physical hardware built or having the intent to distribute the technology is not required to file a patent for it. The patents also endure for a standard term of 20 years according to the United States Patent and Trademark Office. According to Brian J. Love who conducted a recent study on patent litigation timing for the University of Pennsylvania Law Review, many of the patent lawsuits filed involve software written an average of 17-20 years ago. In a technological age where new versions of programs are released (and expected) yearly, the functionality of the software these patent suits champion is almost assuredly obsolete, and the damage to the market value and original inventor questionable. Many of the suits are akin to representing the original inventor of the wheel in a suit against Michelin Tires for utilizing the round shape. The rising problem of patent trolls in the past 20 years has prompted the United States Patent and Trademark Office’s to consider proposals of a revision to the patent fee structure. Currently patent holders must pay maintenance fees at the 3.5, 7.5 and 11.5 year mark of the standard 20 year patent licensing term. Continued fees would ensure that only viable and relevant patents would be maintained, limiting the number of obsolete patents being sold off as minor assets when businesses go bankrupt. Among other anti-patent troll ideas is the SHIELD (Saving High-Tech Innovators from Egregious Legal Disputes) Act introduced last year by House Rep. Peter DeFazio of Oregon and Rep. Jason Chaffetz of Utah. SHIELD seeks to better define the limits of software patents, punish people seeking to abuse the patent (such as patent trolls) and force frivolous lawsuit filers to take financial responsibility for their actions. This is an especially important provision considering that the victims of patent trolls are often smaller companies that risk closure or serious financial impacts as a result of litigation entanglement. While the SHIELD does not solve all of the flaws in the current patent law system, it is a significant step forward in protecting both the rights of legitimate patent holders, end-users and the ability of technology to progress without unnecessary hindrance.